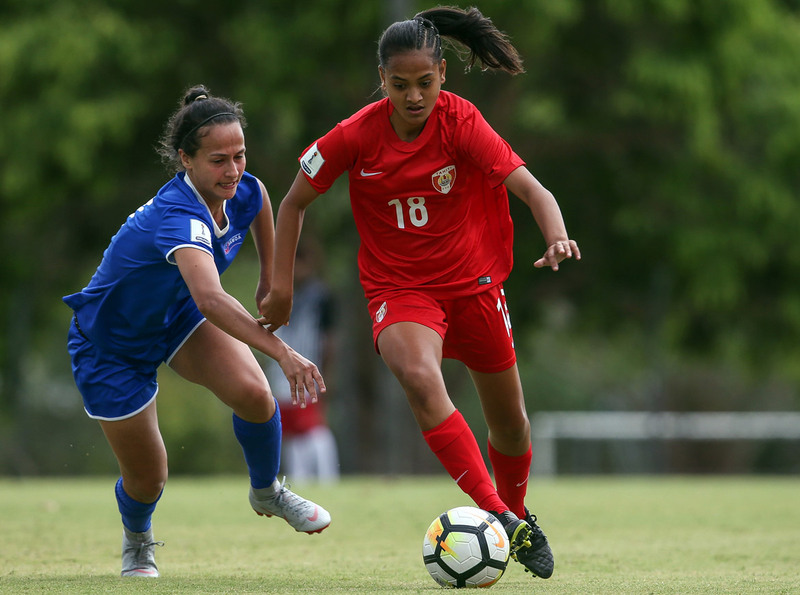 It’s going to be close but there remains a mathematical chance for New Caledonia, Tahiti and Samoa to exit Group A alongside Papua New Guinea in the direction of the OFC Women’s Nations Cup semi-finals. Papua New Guinea secured the place in the semi-finals with a comprehensive 6-2 victory over New Caledonia on Match Day 2, but their final encounter of the group will be against a Tahiti side that has shown great technique and a fighting spirit in their matches so far. Senior women’s football had taken a seven-year hiatus but what has been evident in the performances of the Vahine Ura this far is that is not for a lack of wanting. While Tahiti have assembled a young squad, with the senior players it’s a side which possesses talent, technique and game understanding, which hasn’t gone unnoticed. They’ll need all that nous coming into their final group game against current table toppers Papua New Guinea if they are to realise their objective of acquiring a semi-final berth. “There’s only one match left for us and I hope we haven’t missed out on qualifying because we want to be there at the end,” coach Stephanie Spielmann said. “We’re in a different position than we had hoped because we really needed to win the match against Samoa. But ultimately, we have put ourselves in this situation because we knew we’d be in trouble if we didn’t win. However, despite being comfortably through to the semi-finals Papua New Guinea isn’t a side that likes to turn the tempo down for anyone and they’ll be giving their all against the Tahitians to secure top of the group. Having witnessed the speed and ability to dissect the Samoan and New Caledonian defences already Tahiti knows they’re in for a challenge against Peter Gunemba’s side. And although they have two comfortable wins under their belts already there won’t any complacency on Gunemba’s part, and he expects the same from his highly capable players. “We’ll be going out at full strength. We cannot underestimate anyone in our Pacific region,” he said. In the remaining match it will be all or nothing for New Caledonia as they need to win to ensure passage to a semi-final they’re desperate to feature in on home soil. However after seeing Samoa’s performance against Tahiti there’s an air of concern within the Caledonian camp who know they’ll be staring down an opponent which will leave everything on the pitch in pursuit of their objective. “The sole objective for us now is to win the game against the Samoans,” coach Kamali Fitialeata said. For Samoa’s Nicola Demaine the calculator will be out as they possess a mathematical chance of progressing if they can get the result they desire. “Mathematically it’s potentially still a chance for us to go through, so we’ll focus on that,” she said. In three previous meetings, Tahiti are yet to beat their Melanesian opponents. There are only two meetings between these sides with Samoa leading the head-to-head with a win and a draw.